There is a Truffaut film, rarely seen, named "The Green Room," based on the Henry James short story "The Altar of the Dead." That was about a man whose constant companions were the friends he had lost. He was faithful to their shrines in his memory. The term for his obsession is thanatopsis, a meditation upon death. Truffaut himself plays the hero of his film, and maintains a little chapel to the memory of his late wife and other loved ones. Nathalie Baye plays a woman he meets who shares his devotion, and it seems possible they may find happiness together, but she cannot reach him because his mind seems to reside in the next world. This doesn't seem to be a theme that would attract Gus Van Sant, one of the most cutting-edge of directors, but then he rarely makes films that resemble one another. Here at Toronto he is showing "Restless," an uncommonly touching romance about a young man and woman who essentially worship at the shrines of their own deaths. Their fate is happier than James's characters, however, because the girl with infinite tact and sweetness is able to coax the boy back into the world of the living, even though we learn cancer will allow her only three more months of life. Is this story intended to be realistic, or a parable? Does it matter? The reality of our minds is where we live, no matter how it corresponds to anything else. Van Sant is often concerned with the death of young people, as in "Elephant" (2003), an imagination about the Columbine massacre, and "Last Days"(2005), seemingly inspired by the death of Kurt Cobain. Those were dark and doomy films. "Restless" is gentle and comforting. 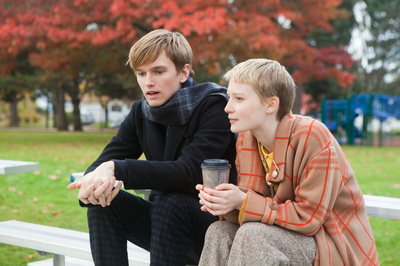 It all centers on Enoch (Henry Hopper) and Annabel (Mia Wasikowska). She is a rising star of the moment, with an ethereal aura. He is the son of the late Dennis Hopper, with some of his father's intensity. When we first see him he is drawing a chalk outline on the floor around his body--a murder scene technique. We remember the world of Harold in "Harold and Maude," but no, he's strange in a different way. They begin to notice each other a lot at funerals. It becomes clear they don't know the deceased. He has a friend named Hiroshi Takahashi (Ryo Kase), who died in World War Two as a kamikaze pilot. The nature of this character is unclear. An imaginary friend? Reincarnated? Van Sant wisely doesn't explain, and simply uses him in a matter of fact way as someone who is there. Then Enoch is joined in his life with someone who really is there, Annabel, and because death is near in her future she wants to simply forget about it, and with the weeks se her remaining experience, as much as she can, the first real romance of her young life. Where Van Sant and the screenwriter Jason Lew found the idea for this story, I have no idea. It is wholly fresh and beguiling. It's not a facile fantasy or a dreamy romantic comedy, but an attempt by these two characters to steal a little happiness from the inexorable march of time. Chaz and I were leaving after a press screening at the Scotiabank Theaters, and saw the lobby actually crowded with fantasy characters in full costume. Star Troopers. Darth Vader. Princess Leia. Many others. 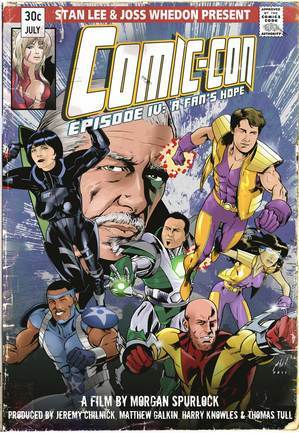 Chaz spotted a big poster for Morgan Spurlock's new film "Comic Con." "Look," she said, " your friend is a producer." Yes, Garry Knowles had a big production credit. And then who was right next to the poster than Harry Knowles himself! I did a double take. Here was a man who had changed. He introduced us to his wife, Yoko. Marriage has been good for him. He cleans up real well. Harry was thinner, dressed elegantly, exuding good feelings. He had a bold new hair style that swooped his red hair up in a wave above his forehead, like a character named Sparky or something, in a rocket ship on the cover of a comic book. Harry said he's in physical therapy four days a week. He was confined to bed for some months by illness, and lost his walking ability. Same thing that happened to me. Now they tell him he'll be out of the chair by maybe December. "I told them I'd come on for our opening night," he said, "but then I wasn't staying because I want to fly right back home and not miss any therapy." This made me feel good. In my mind I was thinking of him as being in much worse shape than he is. Back in the olden days, when few people in power positions in Hollywood had actually even heard of Comic Con, it was Harry and his Ain't It Cool News that did as much as anyone to put it on the map. Now he helped produce the movie. And he had a cover boy haircut. It's all coming together.